Carousell had 70 listings added per minute, and it was getting harder to filter through items in the marketplace. We added product attributes so that buyers can filter listings by how they want to purchase from a seller (meet-up or shipping) and the quality of the item (new or unused), with last-saved data stored to keep the listing process under 30 seconds. It improved our data through additional attributes for each listing but the new filters were not widely adopted by buyers. I was the product manager for the Core Marketplace Team at that time, and I was responsible for the initial research and problem validation, planning the sprints, determining our measurements of success, and engaging with other teams and stakeholders for feedback. I was also responsible for the release copy in the App Store and Play Stores. I worked with Country Leads for release copy translations across multiple markets, and documentation of the sprints and working with the Data team for the metrics and data tracking. I was also the product designer and my responsibilities included design research, writing user stories and copywriting, UI design, prototyping and testing, and hand-off. I worked closely with the Product Team Lead who signed off on the designs prior to delivery. How can we help buyers and sellers reach their ‘magic moment’? The best experience for buyers and sellers are fast transactions. Improving discoverability was one of our team’s key objectives. Matching buyers and sellers in the least amount of time was necessary for our customers to experience the ‘magic moment’ — when a seller gets her item sold and when a buyer receives the item they need — which converts them to long-time users of the platform. We’ve been receiving feedback about the growing frustrations in finding listings on the platform. While we did not have baseline data for the amount of time it took for buyers to find a listing, we had qualitative data from feedback as well as conversion rates from the buy-and-sell journey. In a classifieds platform, matching buyers with the item they are looking for is a top priority. We went through some solutions that we could build with our resources at that time. One of our hypotheses was to have additional filters to help buyers sift through thousands of listings to find what they want. If buyers could identify upfront their deal preferences (meet-up vs shipping, new vs preloved items), it would minimize the chatting time with a seller. By narrowing down the time it takes for buyers to find a listing, buyers and sellers can experience the magic moment sooner. Planning and discussions started in February 2016 and the features were split between sprints, and the new filters on search and browse were released in May. My initial research included gathering data (feedback from customers) and a meeting with stakeholders and representatives from other teams for their concerns and ideas. After which, I created mocks based on consolidated feedback and continued to work closely with the Product team and engineers until release. Qualitative data – I summarized feedback received from our customers about their pain points while buying and selling. We received feedback through email, customer reviews, surveys, and face-to-face discussions with buyers and sellers during events. Competitive analysis – I gathered a list of what buy-and-sell platforms used for their search and filter experience, as well as e-commerce sites. Constraints and resources – We had architectural constraints and limited resources. Although other solutions to the problem of discoverability were more effective, there were limits to what we could build and implement at that time. At its core, Carousell makes buying and selling as simple as possible. Adding new fields meant that creating the listing shouldn’t increase the time it takes for sellers to create a new listing by more than 30 seconds. From conversations with our users, we knew that some sellers kept shipping or meet-up guidelines in their profiles, which they would mention on every listing they post. Others would keep a note on their phone where they copy and paste meet-up or shipping information. We made it easier for sellers to surface the important deal information by saving information they last entered. Gone were they days where sellers have to keep copy-pasting deal information from one listing to another. It will now remember if the seller chose “Meet-up”, “Shipping”, or both, together with the details under each option. It was cross-platform so any information entered on the phone is available on the web. I explored various ways to lay out the new fields and shared the designs with the product team and lead, gathered feedback and made changes as part of the agile process. 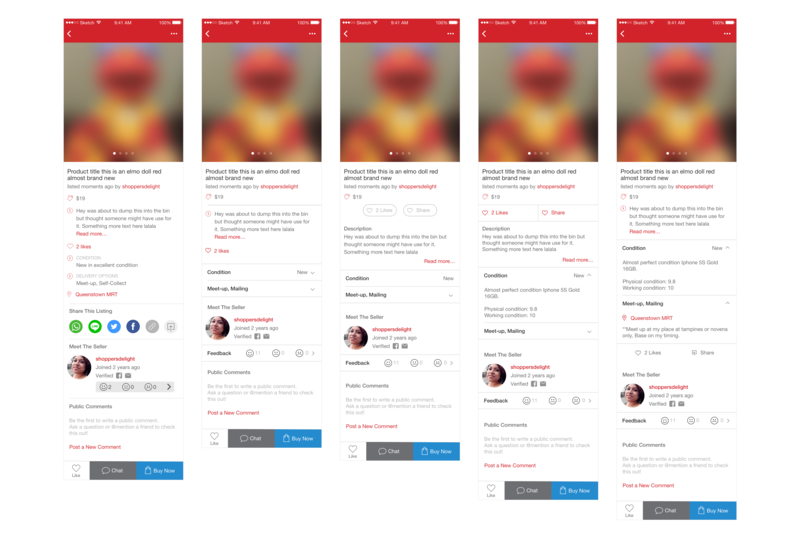 I created clickable prototypes which we tested on other internal teams before finalizing the design. The density of information on the product detail page was also a challenge. I had to simplify the way we presented content in the product detail page. I had to prioritize the information that would be most important at first glance. 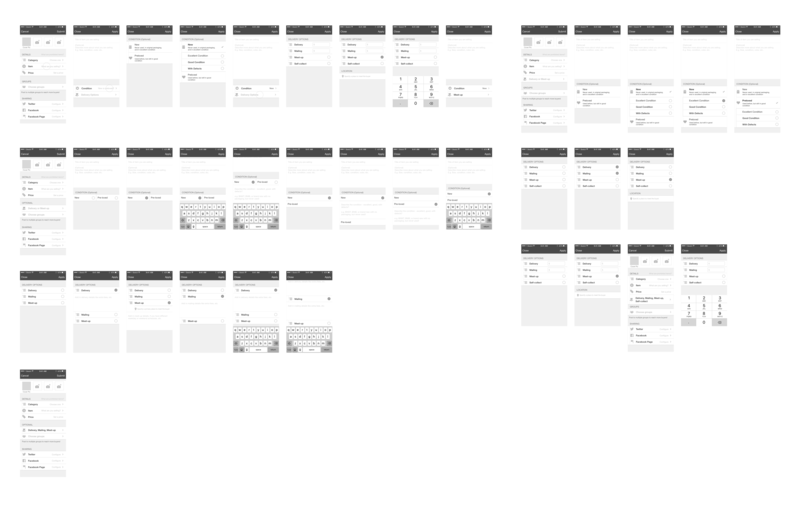 After testing prototypes internally and approval by stakeholders, the UI was finalized and assets were handed off to engineers. The second sprint surfaced the deal options (meet-up/shipping) and condition options (new/used) in the filters for browsing. Adoption rate on listings – to evaluate if we would have enough search results to add the new filters in search/browse. Adoption rate on search/browse – to evaluate the usefulness of the feature for buyers. Within 4 weeks after release, 80% of new listings had new attributes. Subsequent data showed that less than 1% of buyers apply these filters on search and browse. Some users did not see that new filters were available, or did not find the new attributes relevant compared to recency, category, and price. There were other solutions to the marketplace’s discoverability problems that would have had greater impact in the product experience but we had little resources that the alternatives were impossible to build. Despite that, I should have verified first if filters were a need for buyers before we built it. We could have explored surfacing filters post-release so that buyers are more aware of their use, although awareness was not the only problem. The granularity of filters was just not important enough for majority of buyers. Another observation was the slightly higher adoption rate (1%+) for the new filters (new/used, shipping/meet-up) in Western-based markets compared to the Asian markets and I would have wanted to investigate if there were any cultural differences that affect user behaviors in a preloved marketplace. I was also unsatisfied with the design that we shipped for the product detail page. I would like to test a design that I think presents information in a simpler way against the final design for that page. The experience taught me to validate each and every assumption when possible. If it was the least effective solution and we had limitations on what we could build and implement, the team could have used our resources to fix a different problem that was tested to produce greater positive impact for the product.